Known for having silky white hair, the Maltese is a small toy breed that is believed to have descended from the dogs that originated in Central Mediterranean Area. The exercise needs of the Maltese may be met with a short leash-led walk, or indoor games. Its coat, which may be clipped for easier maintenance, requires frequent combing. The Maltese is generally considered an unsuitable outdoor dog but can fare well in either the city or the country. 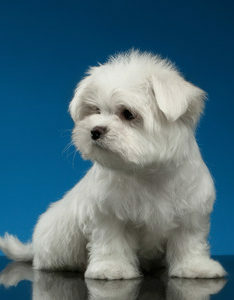 Maltese are bred to be cuddly companion dogs. They are extremely lively and playful. The full-grown Maltese weigh around 3-7 pounds, and may grow from 9-10 inches tall. Maltese have been a long standing breed here at TLC Kennel for over 30 years as they enjoy a steady popularity.